Welcome back to Springwatch at Cottontails - where rabbits are far more than just a furry meal. Today our three presenters, Rabbit Packham, Bunny Humble and Martin Hughes-Carrots, will be reporting on life in our mouse's nest. 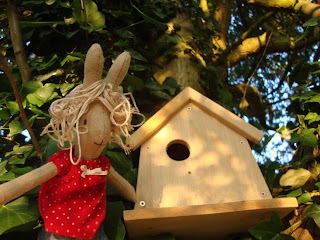 But first, here is Bunny Humble with a quick update on Nest Box 1. And that's it for today, but do tune in next time when we will be introducing our guest naturalist, Charlie Haymunching-Jaws. In the meantime thank you all for your comments and please do get in touch with any photographs or footage of what is happening in the countryside near you. See you next time! that's another wonderful installment, Charlotte! Very entertaining and giving new insights into mouse eating habits! We have a mouse in our flat and we'll now be watching carefully to see if there are any signs that its making cheese sandwiches! Wow, wow, and wow. That was special. I loved the way you began with the fact that bunnies are more than just a furry meal - I am still recovering after last nights disturbing Springwatch episode! I loved the bit where you said the mouslings had not yet formed any red plumage! And the cheese salad sandwiches! Hilarious! You do it so well - talking just like they do on Springwatch! Very creative Charlotte, you are a natural! This is absolutely genius Charlotte! So creative!!! I thought that Humphrey might make an appearance and hop off with the salad!